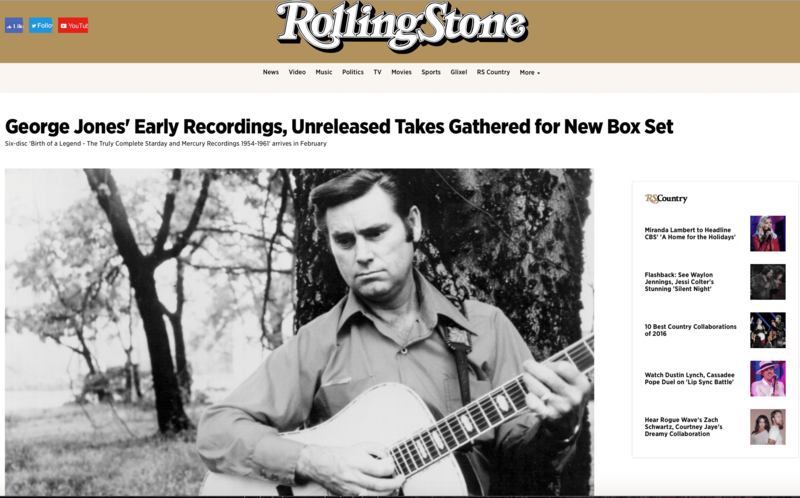 In the 40 years that acclaimed German record label Bear Family has been reissuing classic, career-spanning CD boxed sets, one of the artists whose early work has been on customers' wish lists is country legend George Jones. Christmas has come early for Jones fans as the label announces the February release of a sprawling six-disc collection encompassing all of Jones' early recordings from the Starday and Mercury labels. Titled George Jones: Birth of a Legend - The Truly Complete Starday and Mercury Recordings 1954-1961, the set will include 200 tracks with a total running time of over seven-and-a-half hours. More than 20 of the tracks included are previously unissued takes or never-before-released songs. A deluxe 174-page hardcover book will accompany the box. As a special treat for Jones' completists, the set includes his failed rockabilly single, "Rock It" b/w "How Come It" (released in 1956 with the name "Thumper Jones" in an effort not to derail his country career) and all of his soundalike records for the Dixie label, which found the singer, for instance, doing his best Elvis Presley imitation on "Heartbreak Hotel." He also tackles a number of Hank Williams tunes as well as songs by Johnny Cash, Lefty Frizzell and more.